This paper address two overarching research questions: first, what is the role of religion in transitional justice? Second, does the religious approach to transitional justice differ from the secular approach, and if so, how? In a theoretical section, I examine the underlying religious ideas of various transitional justice mechanisms and contrast religiously rooted ideas with primarily secular ones. Next, the paper applies this theoretical background to two recent incidents in Kenya in which transitional justice mechanisms were employed. First, the paper examines civil society’s response to post-election violence that occured in 2007-2008, with a key focus on the response of faith-based actors. In this instance, the International Criminal Court indicted Kenyatta, Ruto, and others for their involvement in the violence. The formation of a Truth, Justice, and Reconciliation Commission also followed the incident. Second, the paper turns to the very recent case of the Kenyan government offering amnesty to Shabaab militants after the brutal Garissa University College attack in April 2015. This section of the paper focuses on the faith-based sector of civil society’s reaction to the amnesty offer. These examples of transitional justice mechanisms in Kenya are particularly useful for comparative analysis of religious actors’ responses since one—the International Criminal Court (ICC) indictment—represents a secular approach of holding people accountable while the others—a Truth, Justice, and Reconciliation Commission and the blanket amnesty offer—represent a religiously-affiliated approach of forgiveness and reconciliation. Moreover, charting reactions to the different mechanisms constrains the analysis to the same Kenyan civil society, and largely constant faith-based actors. This allows the paper to draw reasonable comparisons and examine how the contexts of conflict affect the reception of different transitional justice mechanisms. Current theoretical discussions, elaborated in the first section, tend to argue that faith-based approaches to transitional justice are generally more focused on forgiveness and reconciliation than secular approaches. The major argument of this paper is that the Kenyan case demonstrates that the transitional justice approaches of religious actors are more complicated than the current literature and theory suggest. The research presented in this paper will demonstrate that the forgiveness and reconciliation approaches do not map neatly onto Kenyan religious actors. This finding and its implications complicate the discussion of religion and transitional justice and raise important new questions for inquiry. Besides questioning the current state of scholarship, this paper adds the case of the Shabaab amnesty to the scholarly discussion—because of its recency there is not yet published scholarly writing on this case. Although there is significant religious diversity in Kenya, it is a Christian-majority state with approximately 82.5% of Kenyans identifying as Christian.1 Therefore, the paper focuses primarily on Christian actors. 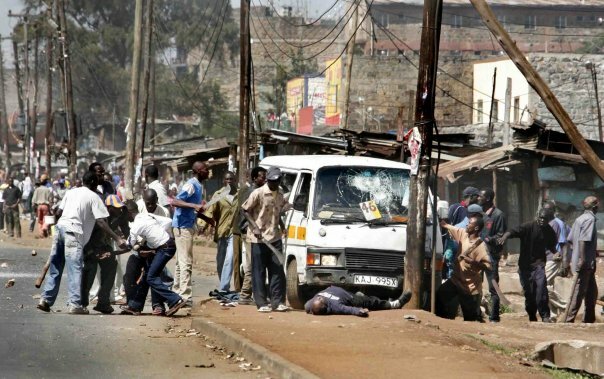 Gallery: Images depicting the chaos of post-election violence, taken in the wake of the 2007-2008 national elections. Photos © Martin Ndugu. This section will establish the specific meaning of key terms and examine how some ideas of transitional justice are rooted in Christian thought. It will also offer a comparison to the secular-liberal approach, which focuses on punishment. In short, this section aims to tease out the current state of the literature on the intersection of transitional justice and religion. While Philpott recognizes plural opinions in the liberal approach—for example, he cites scholars such as Martha Minow who acknowledges the “restorative power of truth telling”15 as independently valuable—he finds religious actors to be more consistently aligned with pro-reconciliation stances. He concludes, “Forgiveness hovers close to the center of gravity of recent religious perspectives on transitional justice.”16 It is to this argument that the Kenyan case offers a counterpoint, for in the two Kenyan cases examined herein, religious actors are less reconciliatory than Philpott’s analysis would lead one to expect. Before moving forward, it is important to note that there is still significant overlap between religious approaches and secular-liberal approaches to transitional justice, and Philpott acknowledges this overlap. It is not only religious people who talk about reconciliation, and it is not only secular people who are concerned with retribution. This essay seeks to demonstrate that overlap and look for contextual reasons why religious actors act differently than Philpott would expect. And finally, regarding the mechanics of the paper: it does not seek to make a normative judgment about either approach (religious or secular) nor does it intend to extol one over the other. Rather, the purpose of the paper is to examine points of difference and sameness between the two, and most importantly, test the claims made by Philpott about religious actors’ propensity for reconciliation using the Kenyan case. Since the nascent constitution of Kenya provided few institutional checks on government, and especially presidential power, political elites merely went on competing for influence with no significant impetus for constituent-based reform or resolution of ethnic disputes. Chief among these disputes is that minority ethnicities have long felt that they were treated unfairly in post-colonial land distribution policies, which were supervised by Jomo Kenyatta, a member of the Kikuyu ethnic group.20 Rather than return the land to its original occupants, non-Kikuyus allege that Kenyatta sold it preferentially to members of his own group, who retained ownership of much of it through the turn of the century.21 Violent conflicts over land have been frequent and central to ethnic tensions. The outcome of the 1992 and 1997 elections prompted further violent clashes, but the combination of civil unrest and a multi-party political landscape was still unable to produce the kind of responsive, constitutional democracy that many hoped for.22 While Moi remained in power, ethnic tensions and land conflicts persisted as they had for decades. However, two years later NARC split over power struggles and the particulars of revising the constitution, and when a new draft of the constitution was put to a referendum in 2005, it was defeated.25 Ethnic minorities believed that the proposed constitution, called the Wako draft, materially ignored the issue of land disputes and thereby unfairly catered to the Kikuyu elites.26 This stagnation, combined with ethnic tensions and the unfulfilled promises of reform by the Kibaki administration, set the backdrop for the contentious 2007 elections. Six suspects, including Deputy Prime Minister Uhuru Kenyatta—the son of Jomo Kenyatta—and William Ruto, who was an ideological leader of the ODM party, were charged with murder, forcible transfer and various other crimes.39 The Kenyan government, and to some extent its citizenry, have been persistent in their efforts to delay or halt ICC proceedings by any means possible.40 The ICC has dropped its cases against several of those it had indicted, including President Kenyatta in December 2014.41 In addition to the ICC proceedings there was also a Truth, Justice, and Reconciliation Commission set up by a Parliamentary mandate in 2009. After many delays and much criticism, the official report of the Commission was released in May 2013, shortly after the presidential election in March of that year.42 It is to the responses of faith-based civil society actors to these transitional justice mechanisms that the paper now turns. The relationship between church and state in Kenya has traditionally lacked delineation, with churches and religious organizations frequently working to influence political events.43 One prominent religious coalition, the National Council of Churches in Kenya, played an instrumental role in bringing about a system of multiparty democracy under Moi’s rule, with particular help from the Roman Catholic, Anglican, and Episcopal churches.44 For several decades, churches and individual Christian leaders were influential in opposition to autocratic governance. Calls for “peace” were seen as an endorsement of the status quo and Kibaki’s administration, while calls for “justice” were cast as sympathetic to the claims of the Kalenjin and Luo fighters that they had been historically marginalized and robbed of their land claims.57 This curious development meant that not only would churches lose the ear of one side or the other by calling for justice or peace, but also that they could invite physical danger through anything but the most carefully worded rhetoric. It therefore became very difficult for most religious actors to function as primary stabilizing factors in Kenya even after the conflict had come to a close, which is where this paper now focuses its attention. Furthermore, many Catholic and Protestant church leaders shared both ethnicity and an interest in maintaining power with Kibaki’s ruling PNU party.60 As a result, their antagonistic stance toward the Truth, Justice and Reconciliation Commission may have been predicated more on political expediency and self-preservation than anything else. What is particularly interesting here is that none of these churches and religious organizations appear to have opposed the ICC trial because of an ethic of forgiveness over retribution—rather, those who opposed the trial argued that a more effective and fair method of achieving punishment would come through local tribunals. This statement, one among many, indicates the cathartic effect of telling one’s story and its contribution in the ability to forgive perpetrators. These statements, and many others like them, demonstrate how interpretations of Christianity can frame the way individuals affected by violence may process and understand acts of violence against them and their families. Blanchard, Lauren Ploch. “U.S.-Kenya Relations: Current Political and Security Issues.” US Congressional Research Service. 23 September 2013. Boesenecker, Aaron P. and Leslie Vinjamuri. “Lost in Translation? Civil Society, Faith-Based Organizations and the Negotiation of International Norms.” The International Journal of Transitional Justice 5 no. 3 (2011): 345-365. “Friends Church Peace Team,” Friends Committee on National Legislation Newsletter 1 no. 1 (2012): 1-4. “Full Report of the Truth, Justice, and Reconciliation Commission (TJRC).” The TJRC. May 2013. Gettleman, Jeffrey. “Ominous Signs, Then a Cruel Attack: Making Sense of Kenya’s Westgate Mall Massacre.” The New York Times, 27 September 2013. Gettleman, Jeffrey Isma’il Kushkush, and Rukmini Callimachi. “Somali Militants Kill 147 at Kenyan University.” The New York Times, 2 April 2015. Githiga, Gideon Gichuhi. The Church as the Bulwark against Authoritarianism: Development of Church-State Relations in Kenya with Particular Reference to the Years after Political Independence 1963-1992. Oxford: Regnum Press, 2001. Halakhe, Abdullahi Boru. “The precarious fate of Kenyan-Somalis.” Al Jazeera America, 19 April 2014. Hansen, Stig Jarle. Al-Shabaab in Somalia: The History and Ideology of a Militant Islamic Group, 2005-2012. New York: Oxford University Press, 2013. Höhn, Sabine. “New Start or False Start? The ICC and Electoral Violence in Kenya.” Development and Change 45 no.3 (2014): 565-588. “ICC drops Uhuru Kenyatta charges for Kenya ethnic violence.” BBC World, 5 December 2015. Inskeep, Steve. 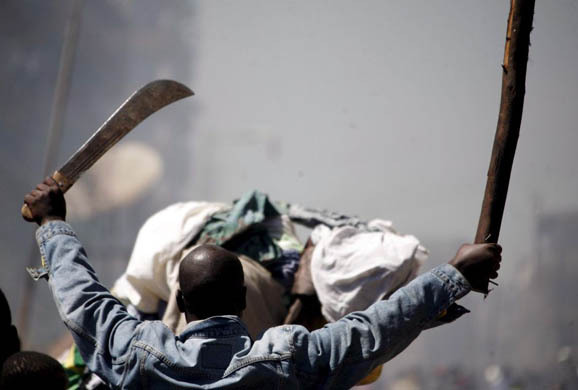 “Kenya’s Post-Election Violence Kills Hundreds.” NPR, 2 January 2008. John Paul II. “Message of His Holiness Pope John Paul II For the Celebration of the World Day of Peace.” 1 January 2002. Juma, Yassin. “Kenyan Shabaab fighters divided over amnesty offer,” Turkish Weekly, 17 April 2015. Kagwanja, Peter. “Courting genocide: Populism, Ethno-nationalism and the informalisation of violence in Kenya’s 2008 post-election crisis.” Journal of Contemporary African Studies 27 no. 3 (2009): 365-387. Kanyinga, Karuti. “Stopping a Conflagration: The Response of Kenyan Civil Society to the Post- 2007 Election Violence.” Politikon: South African Journal of Political Studies 38 no. 1 (2011): 85-109. 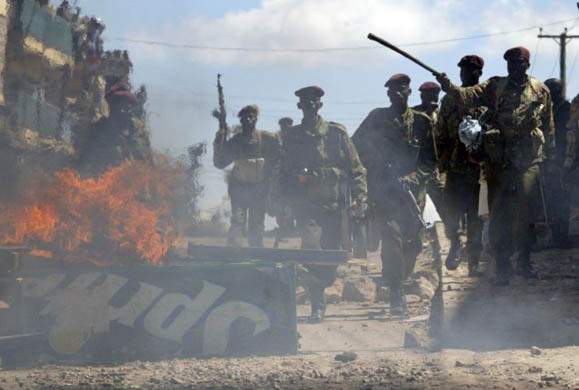 “Kenya: Al-Shabaab – Closer to Home.” International Crisis Group Africa Briefing 102. 25 September 2014. “Kenya in Crisis.” International Crisis Group Report. 21 February 2008, 6. “Kenyan Nairobi explosions kills six in Eastleigh.” BBC News, 1 April 2014. “KPTJ Statement at the ASP.” Africa Centre for Open Governance, 21 November 2013. Nkaissery, Joseph. “Amnesty for youths misled to join Al Shabaab.” Capital FM, 14 April 2015. Marchal, Roland. “A tentative assessment of the Somali Harakat Al-Shabaab.” Journal of Eastern African Studies 3, no. 3 (2009): 381-404. Marshall, Christopher D. Beyond Retribution: A New Testament Vision for Justice, Crime and Punishment. Grand Rapids, MI: Eerdmans, 2001. Meleagrou-Hitchens, Alexander. “Jihad Comes to Kenya.” Foreign Affairs, 21 September 2013. Minow, Martha. “The Hope for Healing: What Can Truth Commissions Do?” in Truth V. Justice: The Morality of Truth Commissions. Eds. Robert Rotberg and Dennis Thomas. Princeton NJ: Princeton University Press, 2000. “News Release: Local Kenyans mobilize for active nonviolence ahead of elections.” Quakers in Britain Newsletter, 28 February 2013. Njogu, Kimani (ed.). 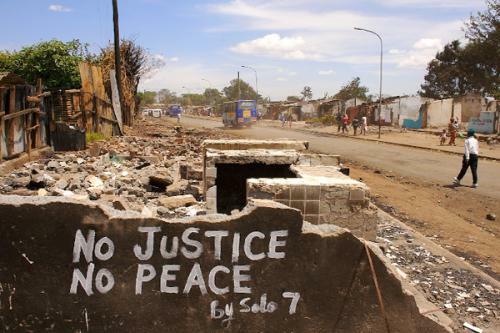 Healing the Wound: Personal Narratives About the 2007 Post-Election Violence in Kenya. Nairobi: Twaweza Communications, 2009. Obala, Roselyne et al. “Leaders react to ICC’s reprieve for post-poll suspects.” Standard Digital News, 5 July 2009. “ODM Churches and Jubilee Churches Differ on ICC Process.” Where Is Kenya, 15 September 2013. Orentlicher, Diane F. “Settling Accounts: The Duty to Prosecute Human Rights Violations of a Prior Regime.” Yale Law Journal 100, no. 8 (1991): 2537-2615. Orji, Nkwachukwu Orji. “Responses to Election Outcomes: The Aftermath of 2007 Elections in Nigeria and Kenya.” African and Asian Studies 9 no.4 (2010): 436-461. Orobator, Agbonkhianmeghe E. “Church, State, and Catholic Ethics: The Kenyan Dilemma.” Theological Studies 70 no. 1 (2009): 182-185. Orobator, Agbonkhianmeghe E. “A Tale of Two Elephants: Overcoming the postelection crisis in Kenya.” The National Catholic Review, 10 March 2008. Paz, Reuven. “The Youth are Older: The Iraqization of the Somali Mujahidin Youth Movement.” The Project for the Research of Islamist Movements (PRISM), 6, no. 2, Herzliyz, Israel, 2008. Philpott, Daniel. “Religion, Reconciliation, and Transitional Justice: The State of the Field.” New York: Social Science Research Council, 2007. Philpott, Daniel. The Religious in Response to Mass Atrocity: Interdisciplinary Perspectives. Eds. Thomas Brudholm and Thomas Cushman. Cambridge: Cambridge University Press, 2009. “Religious Hostilities Reach Six-Year High,” Pew Research Center, 14 January 2014. Smith, Lahra. 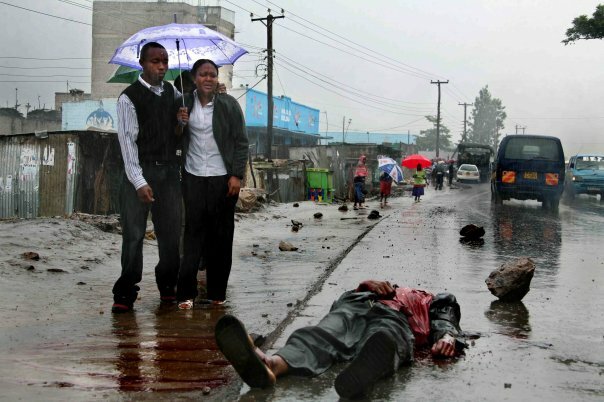 “Explaining violence after recent elections in Ethiopia and Kenya.” Democratization 16 no. 5 (2009), 867-897. “Press Release: Standing With the Christian Faith.” The Christian Leaders’ Consultative Forum. 15 April 2015. “Quakers Mobilize to Promote Peace Before and After the Kenyan Elections.” Friends Committee on National Legislation, 1 March 2013. Rehard, Mary Kay. “What can we do to help with the situation in Kenya?” Quakers in the World Newsletter, 23 January 2008. Straziuso, Jason and Joe Mwihia, “Kenyan Aid Workers Kidnapping: Country with Track Al Shabaab in Somalia,” The Huffington Post, 15 October 2011. Teitel, Ruti G. “Transitional Justice Genealogy.” Harvard Human Rights Journal 16 no. 1 (2003): 69-94. Violent Islamic Extremism: Al-Shabaab Recruitment in America, 111th Cong. 2009. Volf, Miroslav. Exclusion and Embrace: A Theological Exploration of Identity, Otherness, and Reconciliation. Nashville, TN: Abingdon Press, 1996. Wanjala, Silas. “Election violence and peacemaking in Kenya: The experience of one Kenyan Quaker.” Acting in Faith, 6 November 2012. Wasamu, Moses. “Kenyan government offers amnesty to al-Shabaab sympathizers.” World Magazine, 20 April 2015. “The World Factbook: Kenya,” Central Intelligence Agency, 2014. “The World Factbook: Kenya,” Central Intelligence Agency, 2014. The data on religious demography is drawn from the 2009 Kenyan census. Daniel Philpott. “Religion, Reconciliation, and Transitional Justice: The State of the Field,” New York: Social Science Research Council, 2007, 3. Aaron P. Boesenecker and Leslie Vinjamuri, “Lost in Translation? Civil Society, Faith-Based Organizations and the Negotiation of International Norms,” The International Journal of Transitional Justice, 2011 5 no. 3, 347. He articulates this stance in several places, including “When Faith Meets History: The Influence of Religion on Transitional Justice,” in The Religious in Response to Mass Atrocity: Interdisciplinary Perspectives, ed. Thomas Brudholm and Thomas Cushman, Cambridge: Cambridge University Press, 2009. John Paul II, “Message of His Holiness Pope John Paul II For the Celebration of the World Day of Peace,” 1 January 2002. For more on Christian ideas of justice as restoration see Christopher D. Marshall, Beyond Retribution: A New Testament Vision for Justice, Crime and Punishment, Grand Rapids, MI: Eerdmans, 2001. Philpott, 18, citing Miroslav Volf, Exclusion and Embrace: A Theological Exploration of Identity, Otherness, and Reconciliation, Nashville, TN: Abingdon Press, 1996, 23. For more on the mobilization and embedding of the liberal-legal approach as an international norm see: Diane F. Orentlicher, “Settling Accounts: The Duty to Prosecute Human Rights Violations of a Prior Regime,” Yale Law Journal 100 no. 8, 1991, 2537-2615 and Ruti G. Teitel, “Transitional Justice Genealogy,” Harvard Human Rights Journal 16 no. 1, 2003, 69-94. Martha Minow, “The Hope for Healing: What Can Truth Commissions Do?” in Truth V. Justice: The Morality of Truth Commissions, ed. Robert Rotberg and Dennis Thomas, Princeton NJ: Princeton University Press, 2000, 63. Lahra Smith, “Explaining violence after recent elections in Ethiopia and Kenya,” Democratization 16 no. 5, 2009, 878-879. Nkwachukwu Orji, “Responses to Election Outcomes: The Aftermath of 2007 Elections in Nigeria and Kenya,” African and Asian Studies 9 no.4, 2010, 450. Sabine Höhn, “New Start or False Start? The ICC and Electoral Violence in Kenya,” Development and Change 45 no.3, 2014, 568. “Kenya in Crisis,” International Crisis Group Report, 21 February 2008, 6. Karuti Kanyinga, “Stopping a Conflagration: The Response of Kenyan Civil Society to the Post-2007 Election Violence,” Politikon: South African Journal of Political Studies 38 no. 1, 2011, 92. Peter Kagwanja, “Courting genocide: Populism, Ethno-nationalism and the informalisation of violence in Kenya’s 2008 post-election crisis,” Journal of Contemporary African Studies 27 no. 3, 2009, 382. “ICC drops Uhuru Kenyatta charges for Kenya ethnic violence,” BBC World, 5 December 2015. “Full Report of the Truth, Justice, and Reconciliation Commission (TJRC),” The TJRC, May 2013. Agbonkhianmeghe E. Orobator, “Church, State, and Catholic Ethics: The Kenyan Dilemma,” Theological Studies 70 no. 1, 2009, 183. Agbonkhianmeghe E. Orobator, “A Tale of Two Elephants: Overcoming the postelection crisis in Kenya,” The National Catholic Review, 10 March 2008. 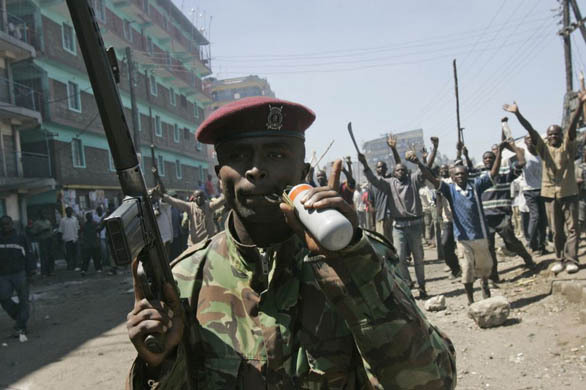 Steve Inskeep, “Kenya’s Post-Election Violence Kills Hundreds,” NPR, 2 January 2008. Roselyne Obala et al., “Leaders react to ICC’s reprieve for post-poll suspects,” Standard Digital News, 5 July 2009. “ODM Churches and Jubilee Churches Differ on ICC Process,” Where Is Kenya, 15 September 2013. “KPTJ Statement at the ASP,” Africa Centre for Open Governance, 21 November 2013. Mary Kay Rehard, “What can we do to help with the situation in Kenya?” Quakers in the World Newsletter, 23 January 2008. “Peace Curricula in Kenya,” Quakers in the World Newsletter, 20 April 2011. “News Release: Local Kenyans mobilize for active nonviolence ahead of elections,” Quakers in Britain Newsletter, 28 February 2013. “Quakers Mobilize to Promote Peace Before and After the Kenyan Elections,” Friends Committee on National Legislation, 1 March 2013. Silas Wanjala, “Election violence and peacemaking in Kenya: The experience of one Kenyan Quaker,” Acting in Faith, 6 November 2012. “Friends Church Peace Team,” Friends Committee on National Legislation Newsletter 1 no. 1, 2012, 2. Kimani Njogu (ed. ), Healing the Wound: Personal Narratives About the 2007 Post-Election Violence in Kenya, Nairobi: Twaweza Communications, 2009, 16. Roland, Marchal, “A tentative assessment of the Somali Harakat Al-Shabaab,” Journal of Eastern African Studies 3:3, 2009, 383. Note: There is disagreement among academics on the exact year of Shabaab’s emergence, but it is commonly dated to 2003 or 2004. Stig Jarle Hansen, Al-Shabaab in Somalia: The History and Ideology of a Militant Islamic Group, 2005-2012, New York: Oxford University Press, 2013, 1. Hansen, 20; Many Shabaab leaders were Afghanistan veterans who were influenced heavily by the ideology of a global ummah and pan-Islamist solidarity espoused by Afghani jihadists (Hansen 22). Violent Islamic Extremism: Al-Shabaab Recruitment in America, 111th Cong. 2 (2009) (statement of Ken Menkhaus, Professor of Political Science at Davidson College, Davidson, NC); Initially the militia contained about 400 men and fought to reestablish political control of the south central region of Somalia (Menkhaus 2). Reuven Paz, “The Youth are Older: The Iraqization of the Somali Mujahidin Youth Movement,” The Project for the Research of Islamist Movements (PRISM), vol. 6, no. 2, Herzliyz, Israel, 2008. Jason Straziuso and Joe Mwihia, “Kenyan Aid Workers Kidnapping: Country with Track Al Shabaab in Somalia,” The Huffington Post, 15 October 2011. Jeffrey Gettleman, “Ominous Signs, Then a Cruel Attack: Making Sense of Kenya’s Westgate Mall Massacre,” The New York Times, 27 September 2013. 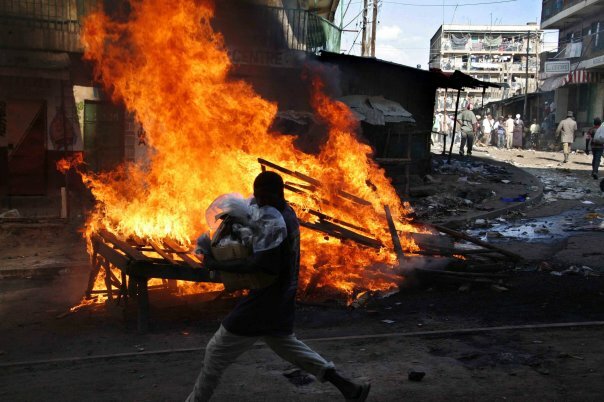 “Kenyan Nairobi explosions kills six in Eastleigh,” BBC News, 1 April 2014. Jeffrey Gettleman, Isma’il Kushkush, and Rukmini Callimachi, “Somali Militants Kill 147 at Kenyan University,” The New York Times, 2 April 2015. Moses Wasamu, “Kenyan government offers amnesty to al-Shabaab sympathizers,” World Magazine, 20 April 2015. Abdullahi Boru Halakhe, “The precarious fate of Kenyan-Somalis,” Al Jazeera America, 19 April 2014. “Kenya: Al-Shabaab – Closer to Home,” International Crisis Group Africa Briefing 102, 25 September 2014, 6-9. Lauren Ploch Blanchard, “U.S.-Kenya Relations: Current Political and Security Issues,” US Congressional Research Service, 23 September 2013. Major General (Rtd.) Joseph Nkaiserry, “Amnesty for youths misled to join Al Shabaab,” Capital FM, 14 April 2015. Yassin Juma, “Kenyan Shabaab fighters divided over amnesty offer,” Turkish Weekly, 17 April 2015. “Press Release: Standing With the Christian Faith,” The Christian Leaders’ Consultative Forum, 15 April 2015. Alexander Meleagrou-Hitchens, “Jihad Comes to Kenya,” Foreign Affairs, 21 September 2013. Maddie Powell graduated in 2016 with a Masters degree in International Relations and Religion from Boston University in Boston, MA.